In the course of this work, we often refer back to questions in the comprehensive Frequently Asked Questions about the GNU Licenses (FAQ). The FAQ is quite long, with over 150 questions. Looking at the Licensing and Compliance Lab's email referrals to the FAQ can help us gauge the questions that are the most frequent, or perhaps the most confusing. We'd like to share some of the insights we've gathered in our work to make our licensing resources as effective as possible. I amassed all the referrals to FAQ questions made by the Compliance Lab from the past 17 years in order to get a better understanding of what types of questions we field the most. This article will provide an overview of the most frequently referenced FAQ topics, and provide clarification and additional resources for more encumbered scenarios. Unsurprisingly, we see a long-tailed distribution. 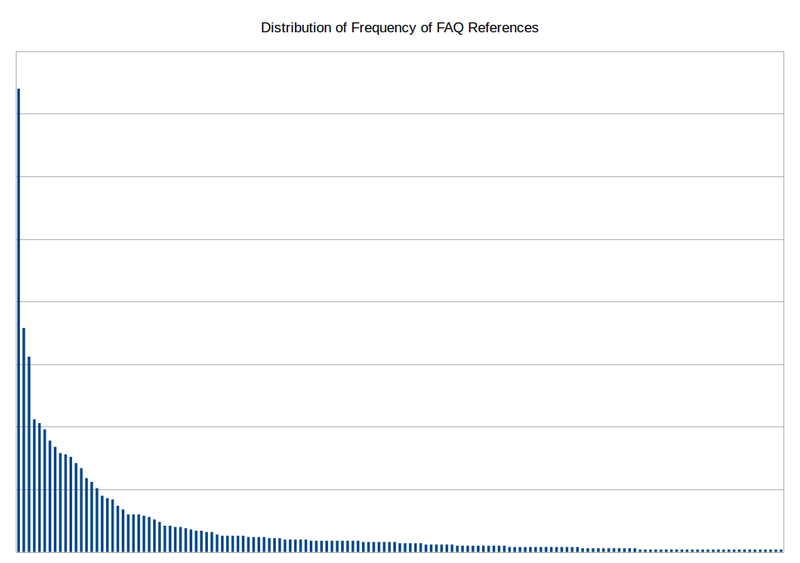 Worded differently, we see great inequality in the number of references to FAQ questions. The top 20 most referred to questions (included below) account for over 60% of the references. The single most referenced question, on incompatible libraries, accounts for over 10% of all references. This question deals with using incompatible libraries with GNU General Public License (GPL) software. The solution, as outlined in the FAQ: If you want your GPLed program to link against a library not covered by the system library exception, you need to provide permission to do that. The FAQ then gives examples on how to explicitly provide that permission. Though only accounting for a fifth of the FAQ, questions about combining work with code released under the GNU licenses account for about half of the lab’s references, making combining work the most frequently referenced topic. Richard Stallman published an excellent licensing guide on gnu.org regarding license compatibility and relicensing at https://www.gnu.org/licenses/license-compatibility.html. As Stallman states, "In general we say that several licenses are compatible if there is a way to merge code under those various licenses while complying with all of them." Even where two licenses are crafted in a such a way that they cannot naturally be combined, however, explicit relicensing provisions can enable code combinations that otherwise wouldn't be permitted. The linked article covers many such questions of compatibility in further detail, and we encourage you to give it a read when researching potential compatibility concerns. Private use questions are quite common as well. The GPLv3 introduced explicit language guaranteeing the freedom to privately modify and run the covered work in order to alleviate ambiguity. Previously, in the GPLv2, such freedoms were regarded as implicit. Additionally, I’d like to highlight that the GPLv3 contains an explicit contractors' provision, permitting companies to give GPLed works to contractors operating exclusively on the companies' behalf. One concern the Compliance Lab regularly sees regards making copies of GPLed programs within a company, and whether such internal copying triggers the copyleft distribution clauses. The short answer is no. The FAQ goes on to explain: “The organization is just making the copies for itself. As a consequence, a company or other organization can develop a modified version and install that version through its own facilities, without giving the staff permission to release that modified version to outsiders. However, when the organization transfers copies to other organizations or individuals, that is distribution." We used to see a lot of questions concerning the perceived differences of the copyleft provisions in the GPL between static linking and dynamic linking. Explained succinctly in the FAQ: “Linking [some program] ABC statically or dynamically with other modules is making a combined work based on ABC. Thus, the terms and conditions of the GNU General Public License cover the whole combination.” Satisfyingly, questions of this nature have been on the decline as the community continues to debunk this false dichotomy. Keep up to date on all the latest in licensing news by joining our licensing-updates mailing list. A company is running a modified version of a GPLed program on a Web site. Does the GPL say they must release their modified sources? I'd like to incorporate GPL-covered software in my proprietary system. I have no permission to use that software except what the GPL gives me. Can I do this? How are the various GNU licenses compatible with each other? Graph by Jake Glass, FSF intern. This image is licensed under an Attribution-ShareAlike 4.0 International (CC BY-SA 4.0) license.